Sound of Music costumes bring this beloved musical to life. Whether a theatre group needs costumes for its production or fans or individuals just want to dress in the costume for an event, there are a variety of retailers that sell or rent the German-inspired ensembles from The Sound of Music. Howard Lindsay and Russel Crouse's novel The Hills are Alive with Sound of Music enjoyed tremendous success as the 1959 Rodgers and Hammerstein Broadway musical and the infamous 1965 film. Numerous productions have also been performed over the years, and the story is still a favorite. The timeless appeal of the love story between the main characters, Maria and George Ritter von Trapp, has captured many hearts. The story takes place in Salzburg, Austria, just prior to World War II; there are elements of danger, drama, and conflict that engage viewers of all ages. Add in the carefully crafted musical numbers, talented cast with Julie Andrews as Maria, excellent costumes - The Sound of Music was a recipe for success, surpassing Gone with the Wind as the top box office hit. The film costumes were designed by Dorothy Jeakins, a three time Academy Award winner for costume design. The Sound of Music costumes are German-style clothing. There are a variety of ensemble changes for theater productions. Due to the number of costume changes for some characters, preparation is essential for productions. Having dressers or dressing assistants may be necessary, and costume run-throughs should be performed to ensure dressers and cast members are comfortable with the limited time frames for changes. Maria requires seven costume changes, including her novice habit, two traveling costumes, both simple and pretty dresses, nightdress, and a wedding dress. Von Trapp requires three costumes - suit, tail uniform and crested flying suit. Uncle Max requires two multi-piece suits, a double breasted suit, and crested flying suit. The Baroness requires her distinguished dress. Nuns require full habit costumes. Frau Schmidt needs a black housekeeping costume. The Von Trapp children also have several clothing changes, including typical childrenswear of the time, curtain dresses, night clothing, dressed up party apparel, sailor suit costumes and jackets. Many theatrical costume shops have these costumes available for rent or purchase. For a full production, check several retailers to make sure the full costume selection is available; some shops may only have Maria's or primary cast member costumes for sale or rent. Some costume retailers specialize in authentic-style German clothing and may have the styles of necessary clothing available, even if they are not costumes designated for Sound of Music productions. 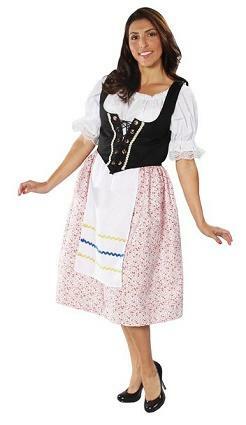 Drindl Dress: This retailer of authentic German clothing has costumes and accessories available for The Sound of Music. ECCT Rentals: Rent costumes for The Sound of Music from Eau Clair's Children's Community Theater. Easy downloadable rental request form is available. Fans of The Sound of Music may attend sing-a-longs, film festivals, theme parties, and other events wearing costumes replicated from the film. There are often costume contests prior to or during these events. Fans of the story may also want to wear the costumes for unique Halloween idea. Individuals may find costumes from theatrical sale or resale shops, eBay, or a costume service like Miller and Campbell. Select Halloween costume retailers may also carry Sound of Music items or themed items which can be used to create the desired costume.